The Russell-Cotes Art Gallery & Museum’s record of the artist Arturo (Arthur) de Tivoli indicated his birth in Viareggio (Italia), as 1891 and death in the UK in 1901, yet they wanted to know if these details were correct. The collection noted that the artist bequeathed a painting to Sir Merton Russell-Cotes (founder of the gallery) in June 1920, and they knew of another later painting, of a scene in Bournemouth. 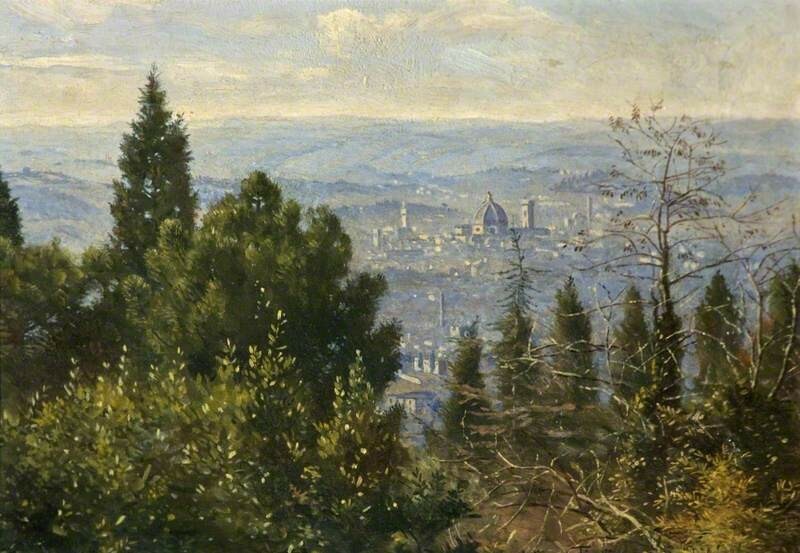 NICE notes that ‘The biography of Arthur de Tivoli is unknown, but he maybe a relation of the Florentine artist Serafino de Tivoli (1826–1890)’: the ‘View of Florence’ held in the Gallery appears to be from the north east above the city, around Fiesole. Andrea Koolman found in the National Archive record an Arthur Joseph W., born 3 October 1891 in Vareggio, father’s name Giuseppe De Tivoli and mother Anne Bevan. Paul Kettlewell traced an Arthur John William de Tivoli, who died in Bournemouth in 1961, who appears in the 1911 census as an art student living in Boscombe with his mother Annie (Anne). Andrea Conti confirmed this information to be correct; she has the birth certificate and the De Tivoli family tree. Andrew Greg questioned the inscription on the two paintings at the Russell-Cotes – 1893 for the ‘View of Florence’ and purchasing date of 1904 for ‘Girl’s Head’ – as these dates do not tally with Tivoli’s birth in 1891. He requests further proof from the Gallery, who suggest a new date 1892, and the possibility of a namesake. Martin Hopkinson’s check with Paul Nicholls only revealed that Artur de Tivoli exhibited in 1914 and 1915 at the Societa delle Belle Art in Florence. Conti reveals Tivoli to be a relative, owns five of his paintings, and suggested wrong dating instead of a namesake, as Tivoli never dated his paintings. Andrea Apostolo also owned a painting of Florence by Tivoli. Conti thought this picture goes back to the 1915–1935 period, when Tivoli was the guest of the daughter of the painter Markò in Florence. His return to England was perhaps to escape racial persecutions, and asks if the painting is inscribed on the back. The ‘Girl’s Head’ painting is inscribed on the back, ‘Study by Arthur de Tivoli, presented to Sir Merton Russell-Cotes by the artist (?) 1920’, but no inscription appears on ‘View of Florence’. Andrew Greg queried the 1893 date again, and commented that the date on Art UK may be misleading. His argument was, if Apostolo’s ‘View of Florence’ is similar then the Russell-Cotes painting is probably of the same period, brought back to the UK in or before 1921 and acquired by Sir Merton. Art UK requests clarification and Greg refers to the Russell-Cotes for confirmation and removal of the 1893 date, plus insertion that it is probably about 1915–1921. The Gallery agreed to this change. Osmund Bullock researched the de Tivoli genealogy between England and Italy, and traced the family from the nineteenth century to Arthur’s marriage to Ethel M. Hedger at Poole in 1930, with her death in 1958 and his in 1961, but found no proof of any children as they left no wills. 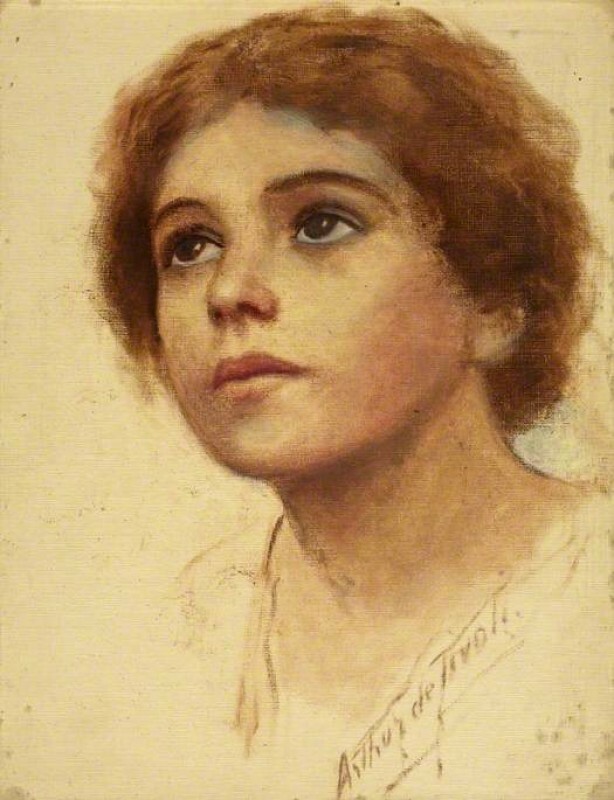 With this the discussion was closed by Art UK and Arthur de Tivoli’s birth and death dates were confirmed as 1891–1961.